As you approach along the towpath, this bridge may look like many others which cross the Monmouthshire & Brecon Canal. But if you take a closer look you’ll see a second, smaller, arch on the north side – built for early railway wagons. The photo on the right (courtesy of the MBACT archive) shows the bridge in 1954, when the canal was derelict. The canal was built from 1797 to 1800 and initially this structure was bridge number two (the sequence started near the Brecon terminus). 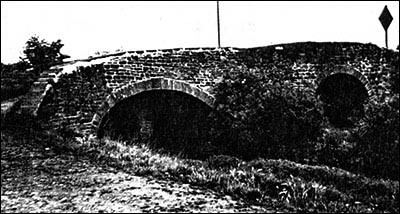 The second arch was constructed c.1815 to carry the road over the new Hay Railway, whose tracks came alongside the canal here at Watton Wharf for transhipment of goods. Horses hauled the railway wagons to Talgarth, Hay-on-Wye and Eardisley. The animation below describes the route. The wharf is shown in the photo below, with a crane and buildings on the land now occupied by the Morrisons filling station and other car-related businesses. The railway and canal eventually passed into Great Western Railway ownership. On the western bridge parapet there’s still an iron GWR notice (partly obscured by the road surface) about the structure’s weight restriction. The house near the bridge on the north bank was built for collecting tolls from passing canal boats. A little eastwards along the towpath stands a row of limekilns where limestone was burned to form lime – used to fertilise fields and for builders’ mortar. 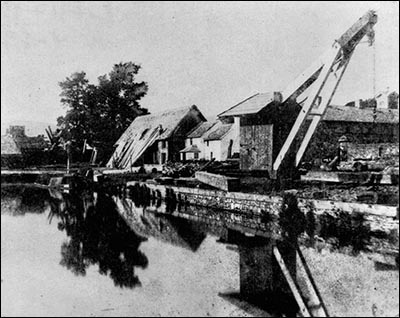 Canal boats provided cheap transport for heavy bulk materials including the limestone and coal needed for lime production. Here the raw materials were fed into the tops of the kilns from the towpath. The best way to view the kilns is to follow the minor road where it diverges from the towpath. The lime was transported along this road. In 2018 the Canal & River Trust completed the restoration of the limekilns here and at Llangattock and Goytre – all of which are listed buildings – with funding from the Heritage Lottery Fund and Brecon Beacons Trust.